A mainstay of California cooking, our tri-tip recipe stays true to the Santa Maria Valley tradition. Fire up the grill, put on our USDA Beef Sirloin Tri-Tip, add a pot of beans and some crusty bread for the full experience. Beef Sirloin Tri-Tip, Water, with less than 2% of the following: Garlic, Onion, Pepper, Spices, Natural Flavorings, Soy Sauce (Water, Soybeans, Salt, Sugar), Sugar, Salt, Dextrose, Potassium and Sodium Lactate, Sodium Phosphate. I believe there is an error on the cooking time for this tri-tip. It says 50 minutes turning every ten minutes. Wondered if it is 50 minutes per pound. Hello Faith and thank you for your question. The instructions as noted on the package should result in a medium interior for the roast. Our Tips & Tricks section (https://www.billbaileys.com/tips-tricks/type/best-bets/) adds more information recommending 12 to 25 minutes per pound, depending upon how rare or well-done you want your tri-tip. And please remember, as you allow the tri-tip to rest before carving, the internal temperature will rise about another 5 degrees. This tri-tip always hits the spot!! It’s always so juicy and tender, oh and the spice flavors are amazing!! I see that you use soy sauce in preparing this item. Most soy sauce contains wheat (gluten). If you are not using gluten free soy sauce, your product can not be gluten free as you state. I am celiac and need a gluten free product. Please specify what soy sauce you use. Yes, our soy sauce is Gluten Free and does not contain wheat. We are required by USDA to state all allergens in the ingredient statement for each product. The look and taste of this Tri-Tip Roast was amazing. My guests at the dinner party were commenting on how juicy and smooth it was. The spicing was perfect. Not too much. It was easy to cook and very easy to slice being so tender. 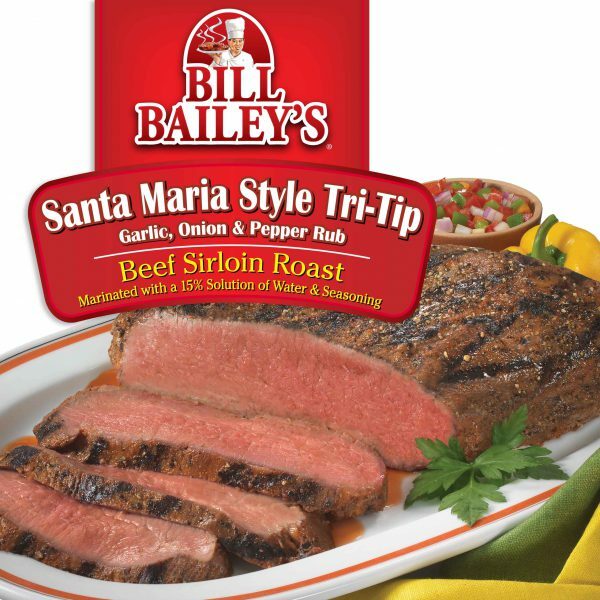 I highly recommend Bill Bailey’s Santa Maria Tri-Tip. It’s truly wonderful.